SRAM Red eTap Review - LA VELOCITA. It was ace. Viva wireless electronic shifting. SRAM power each derailleur with their own rechargeable Lithium-Ion Polymer battery. FSA, Shimano, and Campagnolo have all opted for shared batteries for the derailleurs but SRAM have walked their own path with 4 batteries in total. The shifters require a CR2032 battery each. They aren’t rechargeable but a claimed battery life of 24 months means you probably don’t need to worry. Red eTap ships with a tidy charging cradle. Just run a (supplied) USB cable into it to charge your battery. They supply you with a wall plug if you need. Simply keep it on the juice until the light turns green. Battery life very much depends on your style of riding so my experience may not be indicative of what others can expect. I got to 700kms of exclusively hilly riding before I dropped the rear derailleur battery into the charger where the light showed it was between 25-50%. The front derailleur showed green on the indicator light, so there was plenty of life left. I’m still surprised at opposition to electronic shifting because of managing batteries. Charging batteries is not hard. In fact, a SRAM battery is charging off my laptop while I type this. You can charge it off a dynamo hub, or a USB power bank. Give me a flat battery over a snapped cable any day. Red eTap’s batteries are identical too, so you can swap them over if one goes flat. It could mean getting home on a 1x, similar to different to Shimano’s system of dropping to the small ring and allowing rear shifts only when battery level is low. SRAM’s eTap shifting is simple, reliable, precise, but a little lethargic. Big paddles, and one each side is a great layout. It’s a simple system with just one paddle per shifter. Hit the right paddle to shift towards the flat land gears, hit the left to move towards the hilly gears, and squeeze both simultaneously to change chainrings. It’s a fantastically easy shifting system. There’s the option to just hold down the shifting button and have it sweep as far through the cassette as you like. It’s accurate too. It clunks into gear sometimes noisily, but without any fuss. I’ve always liked independent shifting and braking levers. Shimano’s brake/down shift lever on mechanical drivetrains have always felt a bit weird. I like brake levers to be laterally rigid. It’s not fast though. There’s a slight delay between hitting the lever the derailleur moving. It’s not a big delay but it stands out because this is a professional grade groupset. Changing down a few gears under load when the gradient bites is on clunky side and you might find yourself hesitate on the power a little. Shimano Di2 out-performs eTap when changing under high pedalling load. Despite flying the flag high for electronic shifting, it must be recognised that cables still offer the fastest shifting when comparing high end groupsets. All of the top-level mechanical group shifts are blazing fast, with Campagnolo the fastest of the three big makers. The motors haven’t caught the springs and cables yet. The hoods are pleasant to wrap your hands around with a straight profile, soft rubber, and no pointy bits. SRAM has managed to squeeze the battery, transmitter, and braking apparatus into a very clean housing. I owned SRAM’s Red 10 speed and was not a fan of their hand-feel on the hoods. Red eTap is excellent. Far more comfortable than I expected considering how narrow they are. There were no hand issues to report after 4-5 hour rides. I was less impressed with brake lever shaping. SRAM’s levers are quite flat compared to the svelte, sculpted offerings from Campagnolo and Shimano. That results in so-so leverage and modulation when braking on the hoods, and a long reach to the levers when braking on the drops. This problem is particular to the rim brake version. 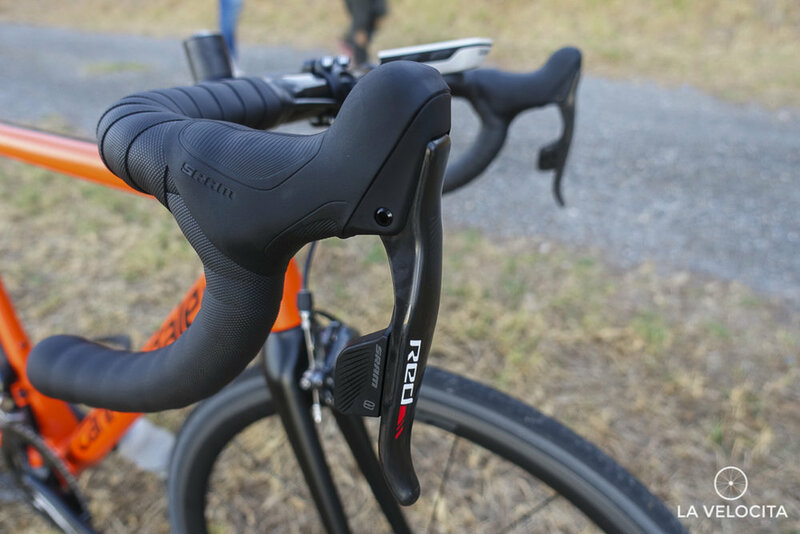 The eTap HRD levers are similarly flat but the increased power and modulation from the discs means the less-than-perfect ergonomics aren’t so noticable. My time with the Red eTap comes far into its life cycle. There isn’t an official word on the next generation but it shouldn’t be far away. With that in mind, I’ve got a wishlist for what I’d like to see. First, I’d like to see more battery options. Rapid battery development means SRAM should be able to cram more capacity into a smaller battery (perfect for the front derailleur) and offer the same size battery with greater capacity (perfect for the rear derailleur). It'd be nice to have rechargeable shifter too. Throwing out batteries feels icky, even when it's this rare. Second, improved brake lever sculpting. It might be nit-picky, but a $3000+ groupset must be held to a high standard. Third, software to allow for personalisation. Shimano and Campagnolo’s software has some cool adjustment options. Modern tech-savvy cyclists are going to want to tweak. Shimano’s ETube gives you a suite of options for customisation, as does their Synchronised Shifting (check out our look at Synchronised Shifting). Campagnolo’s MyCampy app allows groupset customisation and data collection too. Finally, Force eTap. Trickle down technology is a beautiful thing and wireless shifting at a lower price would be amazing. SRAM Red eTap is a mighty impressive groupset, especially given it’s the first generation of new wireless technology. I'm excited for all the possibilities of wireless groupsets. Cleaner frames, easier compatibility, easier to travel with, and less maintenance. There's so much upside to this technology. The ride experience is outstanding too, with intuitive, and accurate shifting. The ergonomics are well-dialled for hours of comfortable riding. There’s plenty of room for improvement from hardware and software but it’s genuinely exciting to see this technology get so good so early. It bodes well for the future of SRAM’s wireless shifting. With SRAM Eagle already spotted in the wild, and rumours flying of Shimano patenting wireless shifters, it looks like the future will indeed be more wireless. That is something to look forward to. The new second tier Shimano road groupset is a big deal. The good news is, a great groupset is now even better.